Small business loan-marketplace Lendio recently partnered with American Express to power the credit card company’s merchant financing offering. The loans, which will help Amex expand its customer base, will range from $5,000 to $2 million for up to a 2-year term. To qualify, a business must have been in operation for at least two years and have a minimum of $50,000 in revenue. The partnership is expected to help Amex make up for the termination of its alliance with Costco, which accounted for 20% of Amex’s outstanding loans. Lendio works on behalf of small business borrowers to match them with the right loan, helping the 75 lenders on its platform reach qualified borrowers. Last year, the Utah-based company facilitated over $128 million in financing to more than 5,100 businesses. 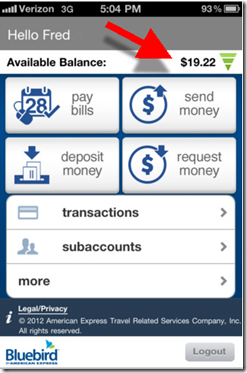 Lendio debuted at FinovateSpring 2011. American Express Global Corporate Payments showed its corporate card programs and supplier payments solutions to help you as you grow your business. The rapid growth of digital and cloud technologies, the evolution of fintech and the globalization of business, present exciting opportunities for the B2B commerce space. Learn how American Express is helping shape the future of commercial payments and the role that APIs and partners are playing in this journey. Klarna Checkout to accept American Express starting in October. See American Express at FinDEVr 2015 in San Francisco next week. Coinbase provides support for 3D Secure credit and debit cards, enabling instant bitcoin payments in a total of 26 countries. SumUp launches mobile payments service in Sweden. Stratos launches EMV Chip Connected Payment Cards in Q4 2015. Ferguson Federal, $57 million in assets, hires Insuritas to launch insurance agency. 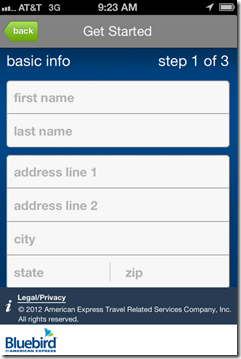 Kony helps ORNL FCU deliver customized mobile app experiences to its members. Tradeshift unveils new e-procurement solution, Tradeshift Buy. Aerospike releases version 3.6 of its NoSQL operational database. See Aerospike’s presentation at FinDEVr next week. TechCrunch: Klarna adds American Express as a partner. Come watch American Express’ presentation at FinDEVr. American Express will focus on the role of B2B payments in the evolving commerce ecosystem. The rapid growth of digital and cloud technologies, the evolution of fintech, and the globalization of business present exciting opportunities for the B2B commerce space. Learn how American Express is helping shape the future of commercial payments and the role that APIs and partners are playing in this journey. 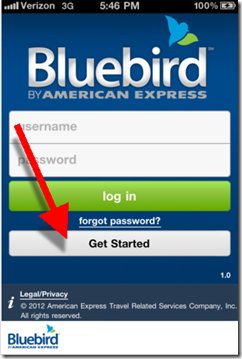 Today, American Express released the iPhone app for its new Bluebird prepaid card which will be sold in Walmart stores and elsewhere. 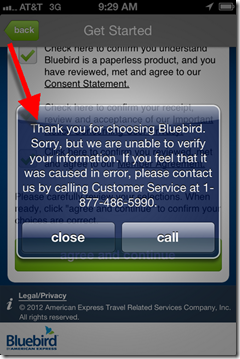 The app allows new customers to sign up for a Bluebird prepaid card, but in my test I was not able to get that to work (see below). My experience: I downloaded the 7MB app today. The only screen visible to non-cardholders is dominated by a login area. 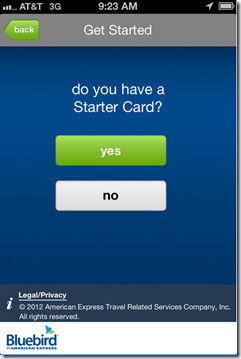 But it also has a Get Started button, which I learned was where you apply for a new card (see number 1 below). It would probably be better to call it “Get your card” or something more obvious. 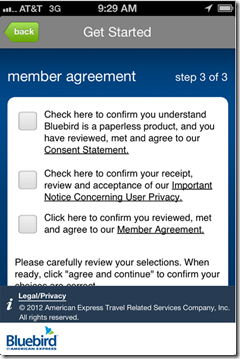 After I clicked “No,” the app took me through a standard three-step process for getting a card including name/address, SS number and disclosures (see screenshots 3-5). For some reason, my company email address did not work (an error message said I could not register with that email). But a standard @gmail address worked fine. 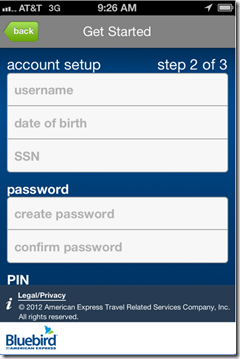 The application also has the annoying requirement for a capital letter in the password which is overkill, especially on a mobile phone. In all, it took almost five minutes to complete because of the various errors I made along the way. But despite being an Amex cardholder for two decades, the company could not “verify my information” (see screenshot 6) and I was declined for a prepaid card. I went back and re-entered everything with the same result. The final error message (which could use a rewrite) suggested that the issue might be my fault. But if I thought otherwise, feel free to give them a call. Which I did. But after 3 or 4 minutes trying to explain to the rep what had happened, I gave up. She was picking up my keywords and reading the script. But she was clearly having trouble following my story. At the 3.5-minute mark mark she suggested I “download the mobile app.” That’s when I signed off. Bottom line: It looks like a great app and I look forward to using it. And I’m willing to cut American Express some slack given how new it is. The app hasn’t even been officially announced, so I’m sure the kinks will be worked out shortly.